Buick has long been a maker of large luxury sedans, so when the Encore debuted in 2013, it was a radical departure from the brand's usual offerings. Nevertheless, the Encore quickly established itself as one of the brand's most popular vehicles. And it's not difficult to see why. The Encore boasts handsome styling, features an intelligently designed interior, and earns excellent fuel economy—all at an attractive price. It's the perfect gateway to a life filled with luxury and refinement. For 2017, the Encore benefits from freshened styling inside and out. It also receives Apple CarPlay™ and Android Auto™ integration. There's an updated gauge cluster with a 4.2-inch Driver Information screen, keyless entry and push-button start for added convenience, plus redesigned 18-inch wheels. It's a common misperception that entry-level luxury cars lack the performance acumen of their more expensive counterparts, but that simply isn't so. 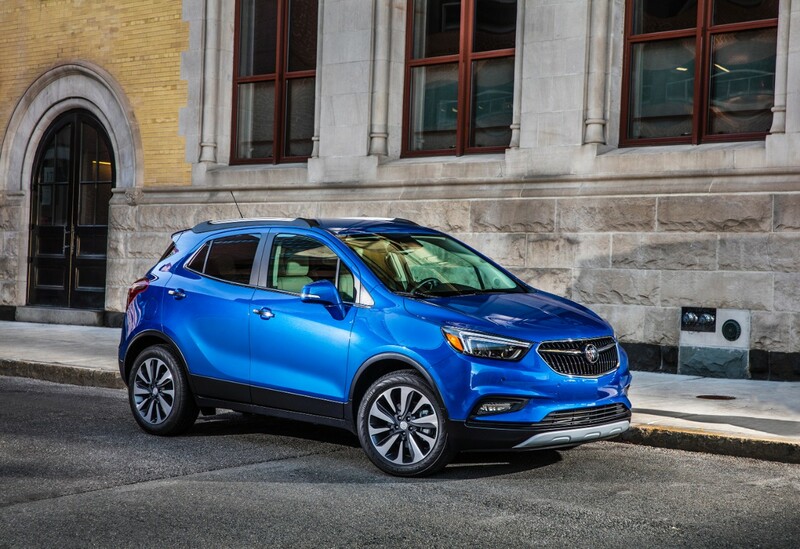 The 2017 Buick Encore is powered by a versatile and capable 1.4-liter inline four-cylinder engine that generates 138 horsepower and 177 pound-feet of torque. A more powerful version of the same engine is available on all but the base Encore. It serves up 153 hp and 177 lb-ft of torque. Regardless of engine or trim type, all Encore models employ a six-speed automatic transmission. Front-wheel drive is standard, while all-wheel drive is an available option that adds an extra degree of assurance and handling on slick surfaces. The Encore also features Buick’s QuietTuning® suite of features for a luxurious driving experience one wouldn’t expect of a small crossover. The 2017 Encore benefits from Bose® Active Noise Cancellation tech. The sound abating technology is particularly impressive. It pumps sound-canceling waves through the car's speakers to help counter unwanted noise. 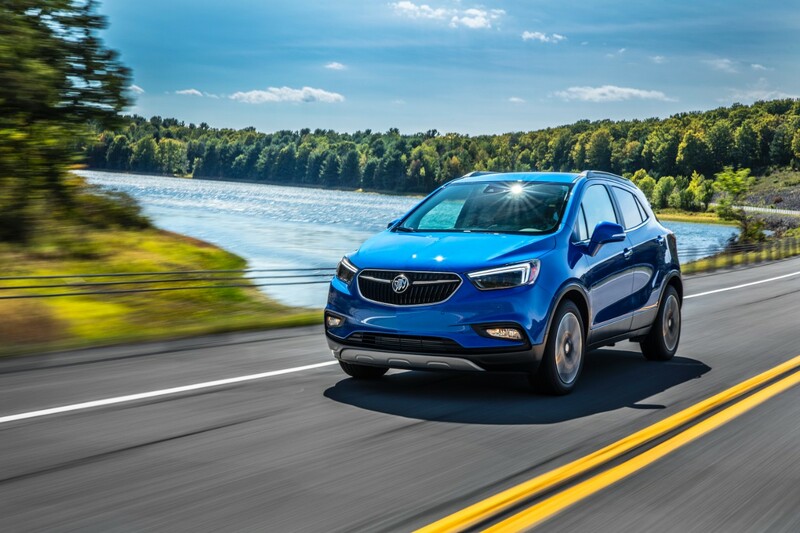 Additionally, the Encore features a suspension designed around a “one tire philosophy,” with everything optimized for the Encore’s 18-inch wheel-and-tire combination to provide the smoothest, quietest ride possible. Preferred models come standard with a six-way power adjustable driver’s seat, a rear 60/40-split bench seat, rearview camera, leather-wrapped steering wheel with audio and Bluetooth® controls, and OnStar® 4G LTE with a built-in Wi-Fi hotspot. 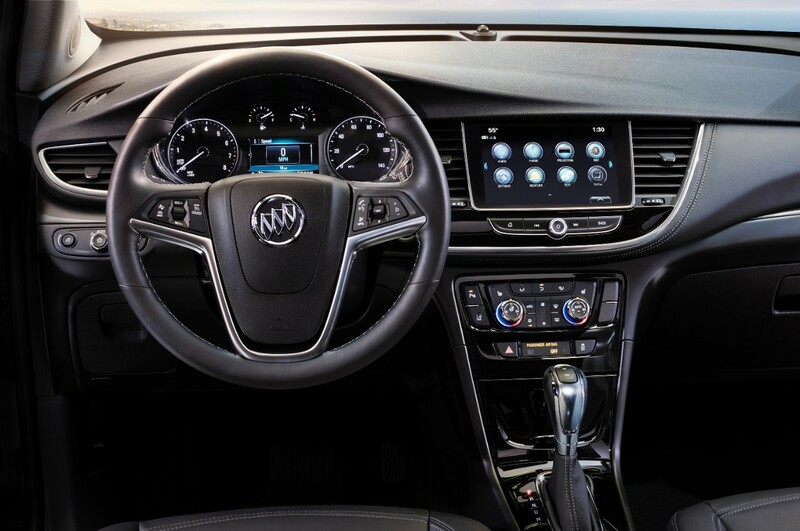 Also standard is Buick's IntelliLink electronics interface, which features an eight-inch touchscreen interface. The following trim levels progressively add more standard equipment, building on (or replacing, where applicable) what’s offered on the Preferred model. The Sport Touring model adds a rear spoiler, remote start, and fog lights among other features. Additional options for this trim include a premium Bose® seven-speaker audio system, blind-spot warning system, rear cross-traffic alert, and unique 18-inch wheels. The Preferred II trim builds on the Sport Touring with even more features. These include dual-zone automatic climate control, an auto-dimming rearview mirror, and blind-spot and rear cross-traffic alert warning systems. Also onboard is a convenient 120-volt power outlet. Next up is the Essence. It boasts additional in-demand features that drivers are sure to enjoy. These include LED headlights, leather upholstery, heated front seats, a heated steering wheel, and six-way power passenger seat. The top-of-the-line Encore trim is the Premium. Upgrades include front and rear parking sensors, a forward collision warning system, a lane departure warning system, automatic wipers, and a seven-speaker Bose® sound system. The 2017 Buick Encore is a segment-skewing model, and that’s apparent from its exterior design. For 2017, it benefits from a newly designed winged grille and sculpted hood, and it sits on sharp new 18-inch alloy wheels. The whole package is decidedly modern and puts a youthful, more progressive spin on the vehicle's styling. We're especially impressed with the Encore's highly sculpted bodywork and its tasteful assortment of bright accents, as well as its prominent LED-accented projector-beam headlights and LED-infused taillights. While its silhouette says small hatchback, the Encore also has a tall roof and high ride height like a traditional SUV or crossover. Why make a crossover this small? 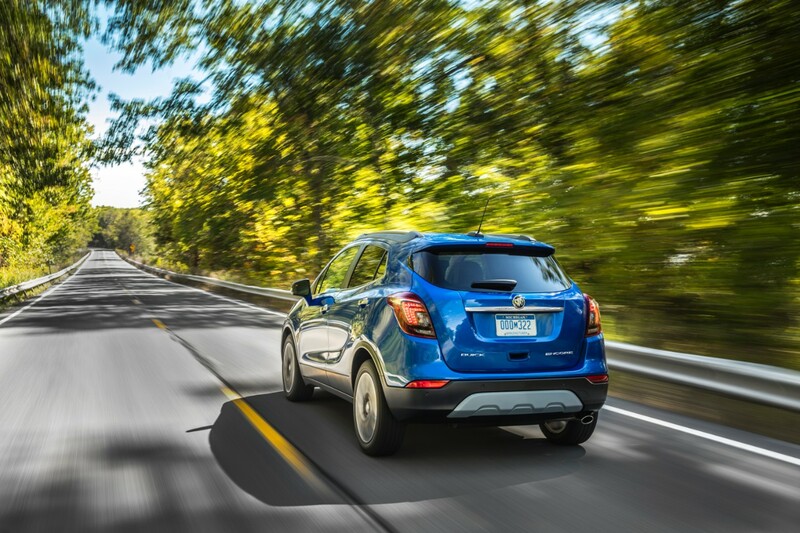 In addition to the obvious fuel-economy benefits, the Encore mixes the high driving position many drivers are looking for with the good visibility and neat packaging of a compact car. And while the Encore is small, its interior leaves a big impression once inside. 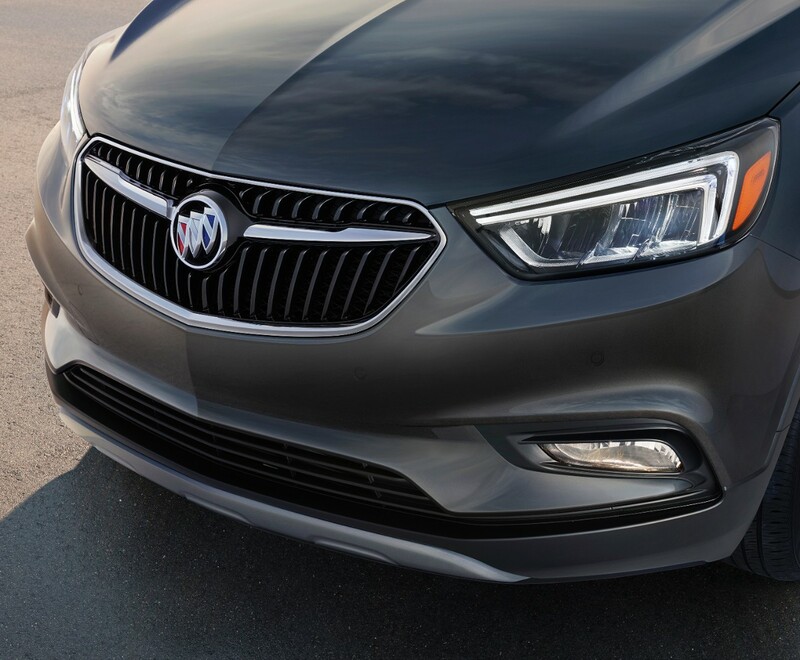 Like any other Buick, the materials are of high quality, and the brand’s concentration on eliminating noise makes for a serene environment. It's clear Buick designers have placed a lot of thought into its design. For example, the now standard eight-inch infotainment screen has been moved from atop the dash to the center stack for greater ease of use, while the larger 4.2-inch gauge cluster includes helpful driver information via the appropriately named Driver Information screen. Standard safety features for the 2017 Buick Encore include antilock disc brakes, traction and stability control, front knee airbags, front and rear side airbags, full-length side curtain airbags, and a rearview camera. Also included is OnStar®, which provides helpful emergency services like automatic crash notification, on-demand roadside assistance, remote door unlocking, and stolen vehicle assistance. For even more peace of mind, a blind-spot warning system and rear cross-traffic alert are standard on Sport Touring and higher trim levels, while forward collision and lane departure warning systems are standard on the Encore Premium. The 2017 Buick Encore has a lot to offer but at a price that is much more agreeable. Shoppers that are concerned with price but still want a true luxury crossover would do well to explore all that that the Encore has to offer. For more information, or to test-drive the versatile 2017 Buick Encore, be sure to contact us online or visit Rivertown Buick GMC at 1661 Whittlesey Rd, Columbus, GA 31904.